I am not going to write of the Feast or the saint who experienced the revelations related to it – for I have not studied them in depth. But I do know of His mercy – and need to know it more and more until I am transformed by it. I long for it, I desire it more than anything. This entry was posted in Uncategorized on April 3, 2016 by mary. Me, I’m washing, bathing, resting, trying to allow. You are a good role model, Mary. P.S. Please forgive the playfulness. It’s late, i enjoyed a long lovely Sunday–Divine Liturgy, divine weather, quiet joy with family and friends–and i’m feeling a bit giddy. (probably just sleepy). And in need of God’s great mercy. I appreciate a bit of giddiness now and then, Al – and glad you had such a lovely day. On a more serious note, the saint from whose revelations “Divine Mercy Sunday” developed was instructed to paint a picture of the merciful Lord. I must confess that I do not like it. In fact, most portrayals of Christ in art do not appeal to me. At first, I was tempted to add some features (hair, beard, etc.). Then I realized that I could not and should not. Anything I drew would necessarily be unsatisfactory for a number of reasons. First, I am not a good artist. Second, I do not know what Jesus looked like when He was in His human form. But more important than all of those things is that these features do not matter. His Mercy is for all people and the color of His skin, hair or eyes, the shape of His nose, ears or face while in the flesh are not part of this essential truth. In fact, they can be a distraction from the message of the totality and universality of His Mercy. 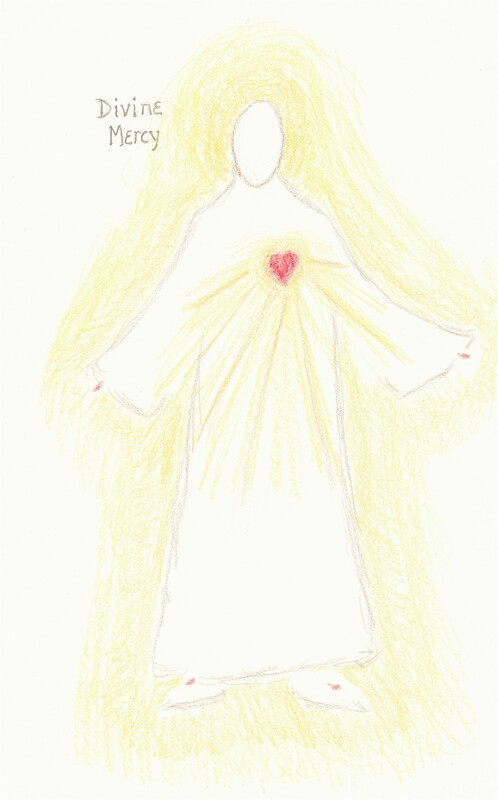 So I drew what I was given to draw – not much artistically – but perhaps God will speak through it in little whispers of love. You are absolutely right about some religious art, Mary. In fact my no-beard etc, question was actually an indirect result of the things I’ve been earning about icons, which are not considered art but rather lessons in theology on the one hand and actual spiritual presences (not literal, but then not not-true either) on the other. While the men in icons have beards and the women seem nicely attired, their faces are generally nondescript and uninteresting (my reaction)–not exactly everyday Joes and Janes, but not the images of success, contentment, joy, or even peace that I had expected. And except for Jesus himself and his mother, the faces convey a kind of serious intensity, bordering on aloofness, that might be off-putting in a photograph/portrait or in person. And all this for pretty much the same reasons that you express in the second-to-last paragraph. I know that you knew all this. But since it’s rather new to me, talking about it helps deepen my understanding and test out my faith. Thanks for your sharing, Al. Sometimes we are afraid to share in such a genuine manner because feel we should screen out such reactions as inappropriate. This inhibits our learning and moving through superficial issues that keep us from deeper experience. Along with my discomforts with much religious art, I also have have had trouble with much of the devotional art of my own tradition. I am still a beginner in learning about icons. I recognize that they are more than religious art but I have sometimes found myself wondering why they must make Mary and Jesus (in some cases) look so unhappy and unappealing. Of course, this reaction is ironic, because I am also critical of the supposedly “appealing” portrayals of a handsome Jesus and attractive slender Mary in religious art. Is there no pleasing me? And, of course, there is no pleasing me – in this sense. If I am looking to be pleased, I am looking for the wrong thing. There is nothing wrong with going to an art exhibit and admiring the masters, but this has little to do with my conversion. I understand that the Sistine Chapel is breath-taking but it does not transform my soul and bring me into lasting relationship with the Lord. So whenever we draw (or write), our efforts to communicate will inevitably fail to communicate the infinite goodness, mercy and love of God. And that is good. Our efforts keep us seeking and sharing – but also humble us before the reality of Him, a reality far too great for us to put into word or image.